I've been after buying an air fryer for a while and the VonShef seems to be rated highly for the price (normally £45-£50) and medium size. Saw this on eBay for £35 from an official reseller which seems like a great price. Next best price is direct with VonShef for £44.99 then £47.99 on Amazon. Says limited stock so not sure how many they have left at this price. No but what's it got to do with a chuffin air fryer? It really is time to grow up now. It's getting really boring. It's like listening to the kid who takes his ball home when he gets skinned by a smaller kid. been using for about a month now, its honestly great in my opinion! 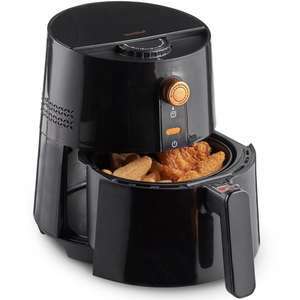 bought from this post …bought from this post earlier:https://www.hotukdeals.com/deals/vonshef-35l-air-fryer-for-healthy-cooking-with-temperature-control-1300w-2999-amazon-dotd-sold-and-dispatched-by-domu-uk-3184553been using for about a month now, its honestly great in my opinion! Ditto , wedges every other night here now. Got this to replace a similar Swan fryer. These are not dish washer safe they remove the coating from both the basket and the base of the fryer. The Swan fryer I have has started to rust and will be binned. I beg to differ. I really am against pointless kitchen gadgets, and hadn't ever had one of these until recently. Only bought one to put us on whilst I fit a new kitchen, but we've found ours to be amazing. I beg to differ. I really am against pointless kitchen gadgets, and hadn't …I beg to differ. I really am against pointless kitchen gadgets, and hadn't ever had one of these until recently. Only bought one to put us on whilst I fit a new kitchen, but we've found ours to be amazing. What kind of things have you made? Tried a few things and was a bit meh. I use it almost every couple of days. You can even prepare delicious steaks with it. You can make fries, sausages, breads, meatloaf, warm up pizza slices, pork belly :), etc!